As expected, the U.S. economy accelerated in the second half of 2016 after a sluggish start that has unfortunately become a pattern this decade. The U.S. Bureau of Economic Analysis has pegged Third Quarter growth (the most recent available estimate) at a strong 3.5%, the best real performance since 3Q2014. Per capita disposable income was up 2.9% in nominal terms, and 1.9% after adjusting for inflation, a notable advance after more than a decade of sluggish gains in this measure. Corporate profits rose in the Third Quarter as well, up $50.1 billion for financial firms and $56.1 billion for non-financial companies, an improvement over earlier 2016 results in both cases. The January 2017 Federal Reserve “Beige Book” national summary indicates that economic expansion continued at a moderate pace through year-end 2016, with tight labor markets and some upward inflationary pressure. Firms and industries were said to be optimistic about growth in 2017. Jobs. With the official unemployment rate measured at 4.7%, the economy might appear to be at full employment. But most economists understand that some slack still exists in the labor markets, with 5.6 million people employed part-time who would prefer full-time jobs and an additional 1.7 million “marginally attached” to the labor force. The labor force participation rate, which has been trending downward since the mid-1990s, now stands at 62.5%. Nevertheless, there are important signs of strengthening, not the least of which is recent wage growth. The BLS “JOLTS” report (Job Openings and Labor Turnover Survey) showed 5.5 million job opening at the end of November, with hiring (5.2 million) exceeding separations (5.0 million) that month. The “quits rate” – people leaving jobs with optimism of finding a better position – accounted for 62% of the separations. The pace of job additions slowed late in 2016, another sign that the pool of available and appropriately skilled workers is becoming somewhat shallow. Policy. 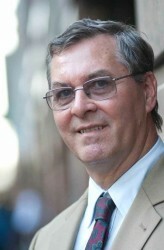 The outcome of the Presidential election signaled a potentially sharp alteration in public policy. The stock market since Election Day has signaled a belief that fiscal policy under President Trump will be stimulative in the short run, with a combination of lower taxation, lesser regulation, and Federal spending on both defense and infrastructure. The bond markets, on the other hand, are pricing an increased risk of inflation and a greater likelihood of interest rate increases during 2017. The Federal Reserve made an upward rate adjustment in December 2016, and as many as three additional moves may lie ahead in the coming year. Outlook. Few observers are willing to hazard a detailed guess, even about near-term changes, as the incoming administration has been exceptionally vague on economic specifics and there are clear differences between 2016 campaign promises and the expressed viewpoints of cabinet nominees on key issues, including trade, healthcare, and budget balancing. 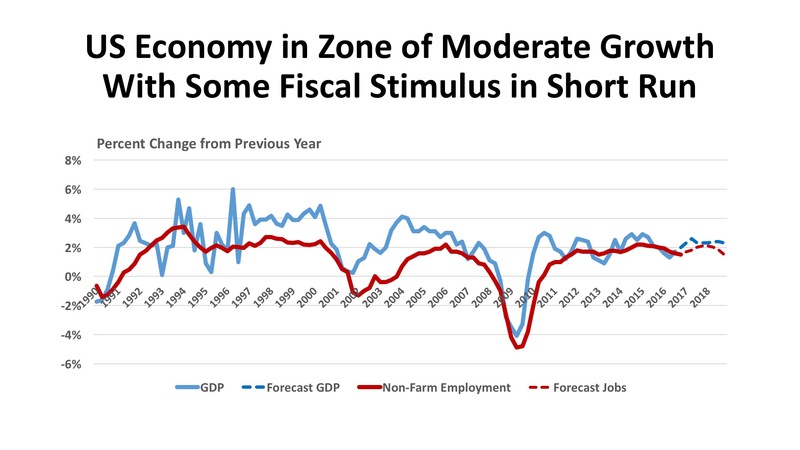 The consensus of Blue Chip Economists holds its forecast as “much of the same” in 2017 and 2018, moderate growth in the range of 2.3% - 2.4% over those years. It is an aphorism that “real estate is a people business.” This refers not only to the nature of transactions, but also that property gains its value via its ability to serve the demand of the population for appropriate places to live, to work, to shop, and to recreate. Demography is fundamental to the real estate industry. 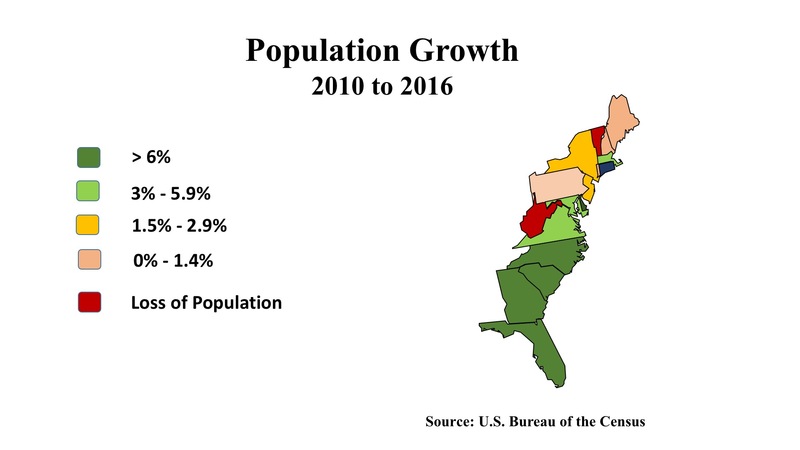 The map of population growth (2010 – 2016) nicely illustrates how, in the Eastern region, growth has been most robust in the southern states – Florida, Georgia, and the Carolinas. New York and New Jersey have grown more slowly though each has added significantly in absolute numbers. West Virginia and Vermont have seen actual population declines, while Maine, New Hampshire, Rhode Island, and Pennsylvania have registered only meager population increases since 2010. At the level of the cities, the employment story has been generally good. Boston, New York, Washington, Charlotte, Charleston, Atlanta, Miami, and Orlando have posted solid gains over the past year. It is encouraging, too, to see more suburban-oriented metros (Hagarstown MD, Daytona FL, Ithaca NY, Salisbury DE) growing at rates exceeding the national average in 2016. The outlook for a significant boost to local economies due to increased military spending affects many areas of the country, and the East will see some positive effects if defense contracting grows significantly. The area in and around Washington DC will certainly benefit, but the entire I-95 corridor up to Boston is home to many prime contractors to DoD. Localities with major military installations – including Newport News VA, Fayetteville NC, and Jacksonville FL. A rising U.S. dollar has crimped some of the industries in the East with an exposure to international trade and tourism, for instance the Broadway theaters in New York and the theme parks in Orlando. Prior investments in port infrastructure seem to be paying off, though, as container traffic arriving on post-Panamax cargo ships bolsters import volumes. On balance, cautious optimism is the prevailing sentiment as 2017 begins. 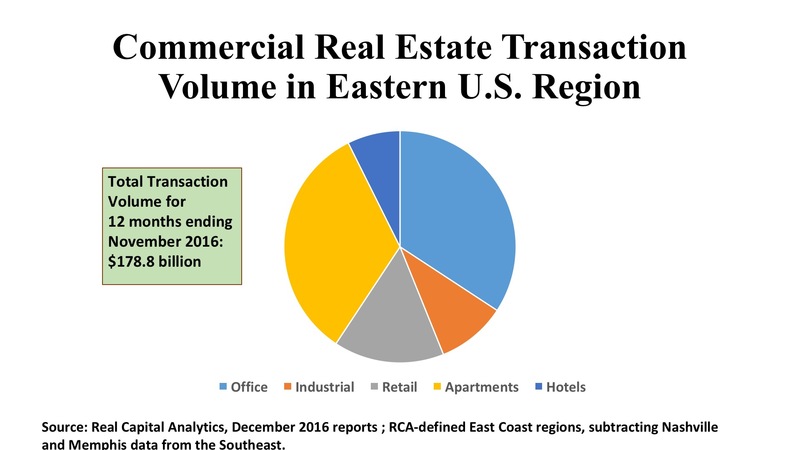 Transaction volume across the country pulled back approximately 15% in 2016, compared with the prior year. This was not necessarily a bad thing, as investment totals were approaching the pre-financial-crisis “bubble level” and there were legitimate concerns of unreasonable asset price inflations. This was especially true in the nation’s major gateway cities. While there are variations by region and by property type, the discussion which follows should be understood in the context of a market pulling back from an exuberant peak in 2015. Office. The office markets on the Atlantic Seaboard tallied $61.1 billion in commercial office investment in the twelve months ending November 2016. This was down 12.3% from the previous year, in keeping with national trends. Manhattan still garners the lion’s share of capital, with $20.4 billion – about one-third of the region’s total. Other CBDs such as Washington ($3.4 billion), Boston ($2.8 billion), and Atlanta ($1.1 billion) saw substantial activity. But the more important story was increased investor attention to suburban markets, which captured $26.8 billion, or about 44% of total in the Eastern office markets. Investors liked the relatively higher cap rates in the suburbs (about 7.0%, or 80 basis points higher than the central city average) and the wider selection of assets available for purchase. Industrial. Investment volume in the warehouse/distribution sector dropped nearly one-third year-over-year, from $25.6 billion to $17.3 billion. Real Capital Analytics notes that this property type had a spike in entity-level and portfolio deals in 2015, which swelled that year’s volume. The retreat in 2016 should be viewed against that background. Boston had an excellent year, with $1.4 billion in industrial deals thanks to a strong performance in the R&D/Flex category. Such space also buoyed the statistics in Miami and the Washington DC suburbs. Warehouses accounted for most of the activity in core markets such as Northern New Jersey ($1.2 billion) and Atlanta ($1.4 billion). One remarkable outlier are the New York City boroughs outside of Manhattan, which posted $1.9 billion in industrial sales, at an average cap rate of just 3.1%. The “outer boroughs” are seeing demand as much for adaptive reuse of these assets as in traditional uses. However, as in many cities, the “last mile” distribution needs of e-commerce are particularly strong in the nation’s most populous city. Retail. Tight pricing belies the impression of widespread struggling in the shops category. Cap rates for non-mall retail assets have been running at 6.0% in the Mid-Atlantic and Southeast states, and at a vigorous 5.1% in the Northeast. Nevertheless, there is no getting around the observation that $27.5 billion in retail property deals in 2016 represents a 29.3% decline from the regional performance a year earlier. Taking all five New York City boroughs together, the Big Apple captured $4.5 billion of the 2016 total, with Manhattan posting a stunning 4.2% average cap rate. Atlanta had the most robust market for shopping centers themselves, with 35 deals generating $1.2 billion in purchase price. Northern Virginia was not far behind, with 35 centers selling for an aggregate $1.0 billion. Risk pricing was higher in Atlanta, at a 6.8% cap rate versus the 6.1% rate typical in NoVa. Miami merits attention, with $1.4 billion in retail property transactions, 41% going to shopping centers and the balance to either standalone assets or high-street shops.